What it’s about: A secret government program to control your mind, maaaaan! At least, that’s the paranoid notion at the heart of a conspiracy theory from the early 2000s that posits that the same government that launched the Obamacare website managed to successfully develop a mind-altering arcade game back in 1981. Polybius allegedly appeared in a select few arcades, mentally scarring those who played it. As the story goes, shadowy “men in black” visited video arcades, where they would no doubt blend in effortlessly, to log the results of their sinister experiments. Strangest fact: The original Polybius probably would have hated urban legends. The game’s namesake was a Greek historian who lived in the second century B.C. Unlike his predecessor Herodotus, who sometimes mixed mythology into the historical record, Polybius believed in only using first-person accounts of events. (He himself was an eyewitness to the Battle Of Carthage.) He also explored the concept of a government’s separation of powers, an idea that directly influenced America’s Founding Fathers. Thing we were happiest to learn: Polybius may not have been real, but that hasn’t stopped people from trying to make it real. Game developer Rogue Synapse created a game with the same name for PC in 2007 and based it on rumored elements of the mythical game. Fans took things one step further and built arcade cabinets that housed a PC playing Rogue Synapse’s game, in turn further fueling rumors, since there were now “real” Polybius machines out there. Thing we were unhappiest to learn: There may have been a real game messing with people’s heads in 1981. An early version of Tempest caused epilepsy, motion sickness, and vertigo. One player in Portland collapsed, while on the same day, a fellow Portlander got stomach cramps from playing Asteroids for 28 hours straight. Ten days later, the FBI raided several Portland arcades on suspicion of gambling. It’s believed that these three seemingly unrelated incidents were conflated, and the Polybius myth was born. Best link to elsewhere on Wikipedia: The urban legend Wikipedia page could probably serve as a jumping-off point for a decade’s worth of Wiki Wormholes. Besides analyzing the phenomenon, the page references War Of The Worlds, stolen kidneys, hitchhikers, Nazis, Satanists, cars with their headlights off, serial killers hiding in the backseat of your car, and our personal favorite (which we hadn’t heard before) that Orson Welles had planned a Batman movie in the ’40s, with James Cagney as the Riddler and Marlene Dietrich as Catwoman! Further down the Wormhole: Polybius has made its mark on pop culture. It’s appeared in arcades on The Simpsons, The Goldbergs, and in the first issue of Batman Incorporated. 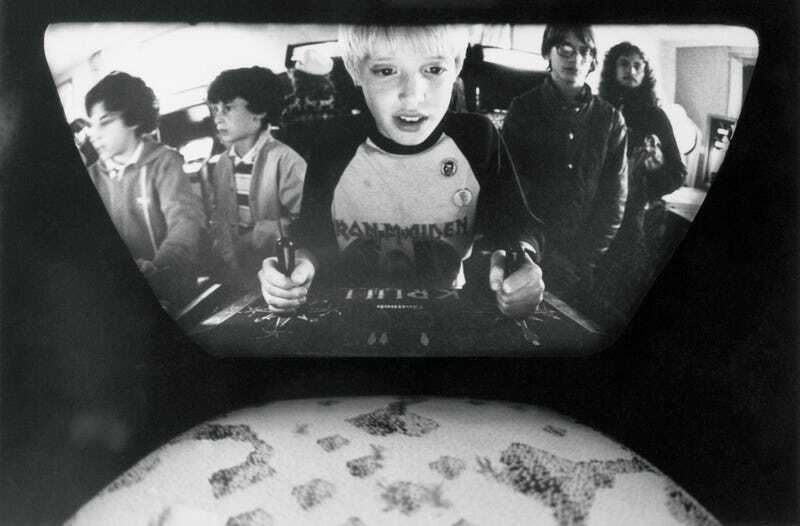 The plot of 1984 sci-fi film The Last Starfighter centers around a video game covertly placed into arcades to monitor gamers, except by aliens hoping to recruit fighter pilots, not the government. Starfighter was one of a raft of sci-fi films released in the wake of Star Wars’ massive success, and even used one of that films’ production designers, Ron Cobb. Of course, no one is more instrumental to the Star Wars saga’s visuals than Ralph McQuarrie, whom George Lucas hired to create concept art for the original film, producing some of the most iconic images in film history. With a new Star War on the horizon, we’ll go back to McQuarrie’s work next week.